Where a whole world of marine adventure awaits, come and explore it all with us. Dolphins are some of nature’s most extraordinary and captivating creatures. And they’re even more amazing close-up. Immerse yourself in their world with Dolphin Encounter Kaikoura, an unforgettable experience in one of New Zealand’s most breath-taking destinations. Imagine: you’re in the open ocean, the stunning Kaikoura coast in the distance, the cares and concerns of the world even further away. There’s just you, the sky, and gentle, lapping waves. Until the dolphins come. Joyful, social dusky dolphins, frolicking in their natural environment. Together, you’ll leap and dive through the water, feeling the incomparable thrill, adventure and joy of being truly free. Once you experience your time with the dolphins, you’ll never forget it. Secure your encounter today. People come the world over for this opportunity. Make sure you're one of them. The boat cuts through the gentle Kaikoura waves, gliding towards a wide horizon. The air is alive with the salty tang of ocean spray, but you’re dry and warm, safe onboard with your fellow dolphin watchers. The sound of the engines falls away. And then, there they are. Dozens, hundreds of dolphins, leaping, flipping and jumping in a one-time-only acrobatic spectacular. As they leap, so does your heart. As they move with an unrestrainable joy, so does your smile. Be there for an unforgettable encounter. When you encounter the dolphins, you leave transformed. Share the experience. Dolphin Conservation: It’s up to all of us. We’re committed to protecting Kaikoura’s dolphins, environment and other marine life. Our tours are designed to operate with the least impact possible. When you swim or tour with us, you can be confident the dolphins and the environment won’t regret your presence. We’ve been sharing unforgettable dolphin encounters with people from all corners of the globe for nearly 30 years. Dolphin Encounter Kaikoura is New Zealand’s first company to offer swimming with dolphins. 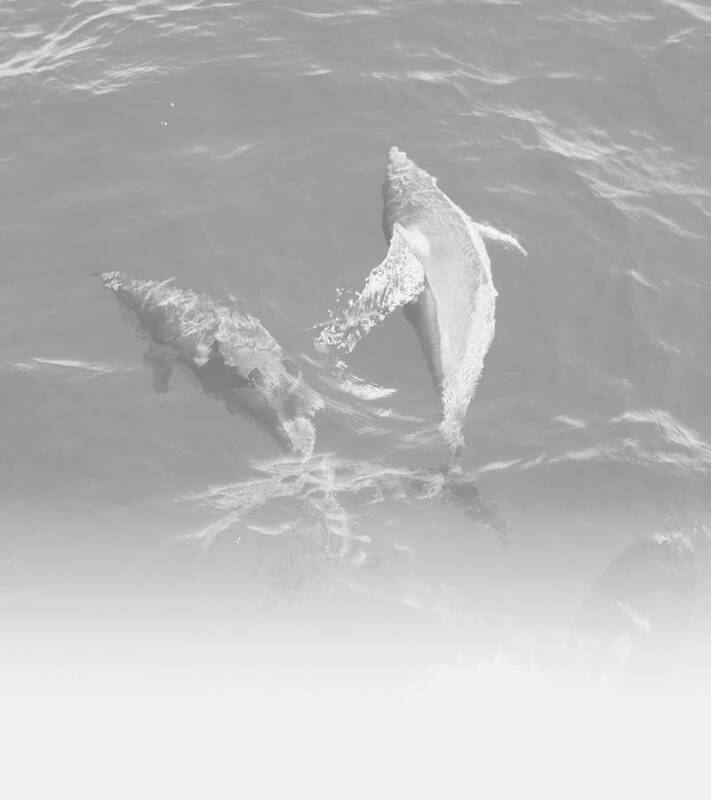 Since then, we’ve built up an unmatchable level of experience, knowledge and insight about dolphins, and the best ways to encounter them in safe, humane and environmentally-friendly ways (not to mention exciting and joyful!). We’re proud to have introduced many thousands of visitors to the uniqueness of our local environment, and the abundant and diverse marine life that inhabits this very special piece of New Zealand. Joyous. Social. Acrobatic. Delightful. Kaikoura’s dusky dolphins are heart-warming characters you’ll remember forever. 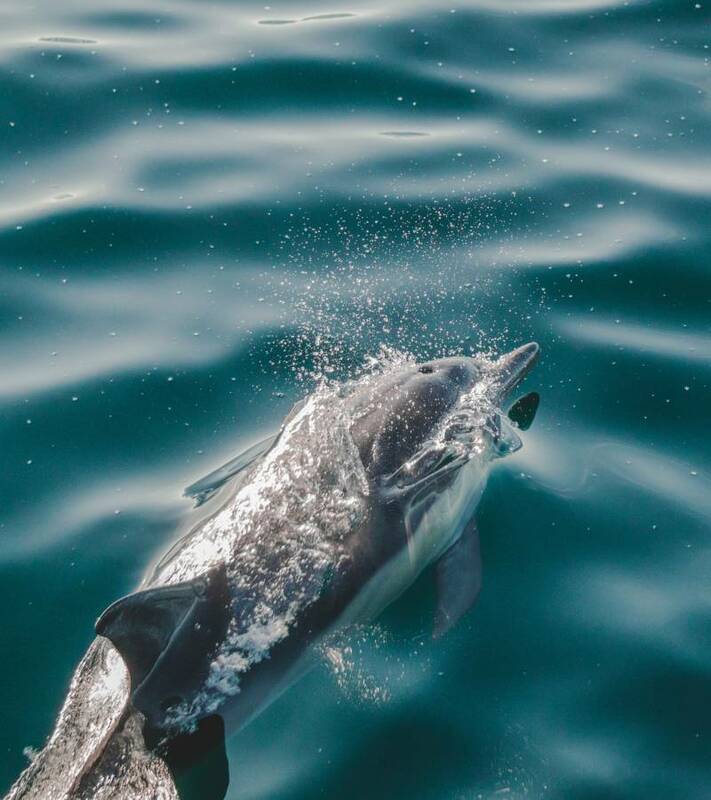 They’re the most acrobatic of the dolphin species, so be ready for the best dolphin show on earth-because Kaikoura is one of the best places on the planet to encounter them in their natural habitat. The Dolphin Encounter tours operate from the Encounter Kaikoura site which is located at 96 Esplanade in Kaikoura. The building is clearly visible and has a large customer car park available for your vehicles to park safely while participating on our tours. There is also a café which makes it quick and easy to grab a bite to eat and a drink while waiting for the tour to depart and also a gift shop to browse through too. The outdoor courtyard has plenty of seating available and is a pleasant place to spend some time taking in the beautiful views of the ocean and the Kaikoura mountain range beyond. 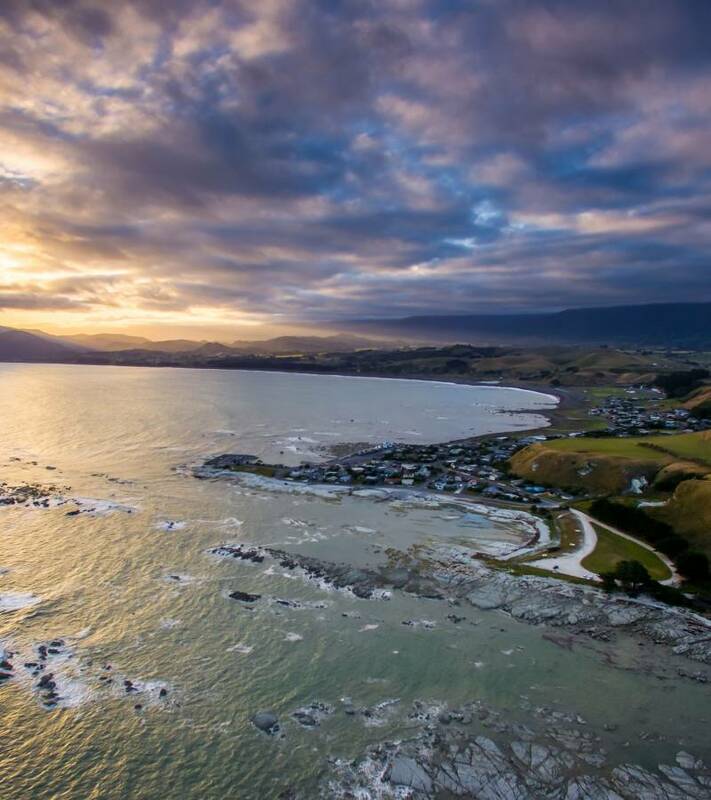 The Encounter Kaikoura site is a short, 5 minute walk from the town centre and is close to many of the waterfront accommodation providers on the Esplanade.